The anthropological sciences occasionally have to deal with something which has a profound but unexpected impact on our understanding of human origins. Two events are noteworthy, in part because both impacted powerfully upon our concept of human evolution, but also because they were diametric opposites. One was a truth first rejected, and the other was a false contrivance embraced as fact. As presented in Roger Levin’s fine text, “Bones of Contention", the stories of the Piltdown Man and the Taung Child were meaningful because they demonstrated that ultimately the evidence will lead to the truth, but first, one must examine that evidence with an impartial and open mind. Most advocates for the film being a hoax tend to rely upon anecdotal claims and suspicions that Roger Patterson was an untrustworthy man, and thus the film must be suspect, if not outright condemned, as equally untrustworthy. But aside from the inherent unreliability of anecdotal material as evidence, one must go further and ask, does this anecdotal material in any way change the empirical evidence? Does it change the film type, the camera type, the image resolution of the film, the filming sequence of events as shown in the film, the potential for stereo-photogrammetry analysis to map the subject walking through the landscape and the camera operator pursuing the subject while filming, or the analysis of the subject figure’s body in motion? If anecdotal material does not change any of these empirical subjects of analysis, then the analysis can stand on the empirical data, and the anecdotal material, regardless of how juicy the gossip, can be recognized for what it is, gossip. There are only two reasonable explanations for why no conclusive proof of a hoax has been produced. One explanation would be to say the evidence is insufficient to make a rigorous conclusion. The other explanation is that the film cannot be proven to be a fake because it is not one. And this second explanation is what the anthropological sciences need to be mindful of, because if this is in fact the explanation, then a new and significant reconsideration of the hominid family tree is in order, and a new hominid needs to be added to the family. And that would be a major development most anthropologists would dream to accomplish, so their name may go beside Leakey and Johanson in the annals of human origin studies. 1. This film has 954 known film frames of 16mm film using a film stock famous for its image quality. The film is in perfect focus, and was processed to yield a perfectly exposed image, so one cannot say that the evidence is lacking either quantity or quality. The film’s resolution is such that the subject figure seen walking away from the cameraman is captured with sufficient detail to determine or identify anatomical elements of the body between 0.5” and 0.4” in size (based on two studies by independent experts). One cannot say the body aspects or features are too vague for analysis. The camera was hand held and the operator moved while filming, so there is motion blur from the shaking camera for some frames, but at least 350 of those 954 frames none-the-less are stable and sharp, dispelling the myth that because of a shaky camera, no determination can be made. And when the operator was closest to his filmed subject, and there were no significant landscape elements obscuring his view, the cameraman planted himself firmly in place and filmed a segment with a steady hand, during which time the filmed subject changed the path of its walk, looked back directly at the cameraman, and then briskly snapped its head back to a forward posture and rapidly strode away. Anyone who claims the evidence is insufficient to do a proper analysis that could prove a hoax is simply misinformed or unqualified to appreciate the evidence. If the film is a hoax, the evidence is more than enough to support a splendid proof. 2. Many detractors of the film argue that the hand held and sporadic shaking of the camera somehow impedes a proper investigation (and often implying the cameraman did so deliberately to prevent a hoax from being revealed). But nearly any special visual effect technique which allowed a film to be “tricked” required a lock down camera on a tripod, and pin registration to hold the film securely and precisely in the film gate, frame after frame, so any special effect alteration could be integrated in a believable manner. The camera used had no pin registration, and the hand held operation (plus sporadic motion blur) utterly demolished any prospect of altering the film after processing. Even the idea of editing to alter the segment content and misrepresent the activity of the day could not be done undetectably because of the way the first copies were made and any editing would show easily and absolutely on said copies. In this respect, we can say categorically that the film was not altered or edited to hide evidence of hoaxing and create false evidence of authenticity. 3. Forensic analysis of the film using techniques and technologies, that did not exist in 1967 when the film was taken, have been applied to this film’s analysis and if ever there was potential to reveal a truth and expose any hoaxing, these new technologies are ideal. Clever hoaxers (like stage illusionists) use false positive suggestions and misdirection to distract an analyst from seeing how the hoax was staged. But any hoaxer can only create false positives for analysis techniques he/she knows exist at that time, and will likely be used to analyze the film. If a hoaxer in 1967 could not anticipate what future analysis technology a film may be subjected to, the hoaxer could not create false positive components in the film to deceive analysts of the future. Any staged film production (including a hoax), done with calm deliberation of intent to plan and execute, has certain characteristics for how the filming is accomplished. A truly spontaneous and unplanned filming of an unpredictable event has distinctly different characteristics. Analysts in 1967 may not have been able to determine the differences with 1967 film analysis technology, but future analysts with new and sophisticated technologies can find those mistakes and clues to a deliberate filmed event. So, this new technology should guarantee proof of a hoax if one occurred. But those who advocate a hoax have not only failed to put this new technology to the task, they have utterly rejected this incredible tool to make their case. One might reasonably infer they have no confidence they can prove a hoax, due to the modern technology and the vast body of excellent empirical evidence in the film. 4. Given the excellent resolution of the film, and the robust range of motions demonstrated by the filmed subject, analysts have abundant opportunity to analyze the anatomical features and try to determine if a fur costume, worn by a human performer, is what we see in the film. But the contrary is true. The anatomical features show instead many characteristics of real anatomy, and features which rule out a fur costume based upon the technology of the era. It is rarely appreciated that fur costume technology of 1967 was relatively simple and the physical materials were tailored in predictable ways and the fur material behaves in accordance with the basic laws of physics and motion dynamics. Looking for evidence of a fur costume simply takes an understanding of how such costumes are designed and built, and how they move with a human inside driving the motion. There is no mystery to these factors. One merely requires a reasonable knowledge of the process. These four factors argue powerfully for more scholarly consideration and discussion of this film. Hoaxes abound, sadly, in all the sciences. Even hoaxed fossils occasionally appear, as paleontologist Stephen Czerkas and National Geographic discovered when he had access to a Liaoning, China dinosaur fossil that eventually proved to be a patched together forgery of several fossil pieces unrelated but connected to appear as one. This means we cannot begrudge any scholar the caution of being hesitant to do a serious analysis of a piece of evidence when there is a suspicion of hoax. Indeed, we would admire the scholar’s caution. But hoaxes fall apart on rigorous analysis, if someone simply is willing to take a careful look. 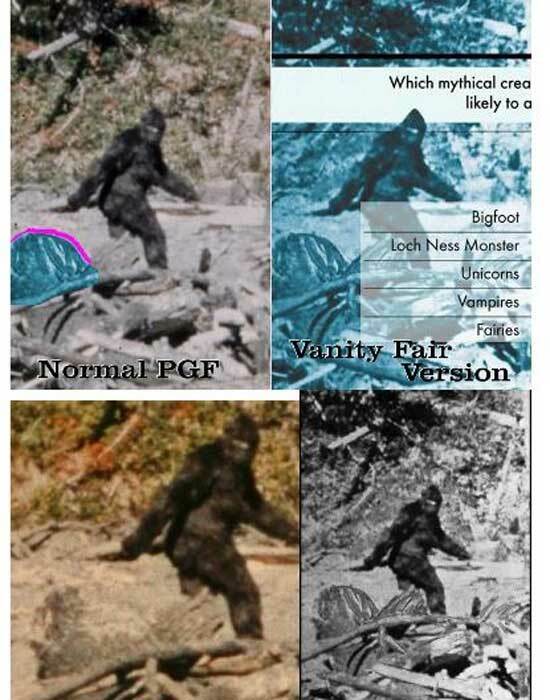 The PGF is the exception, defying exposure as a hoax. 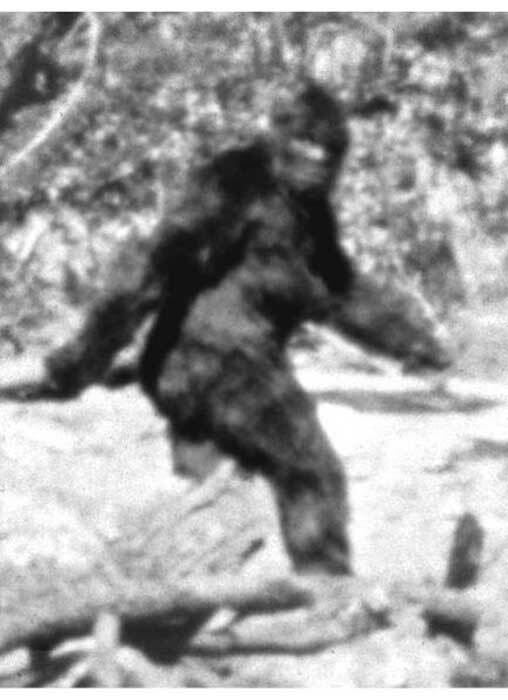 One obvious detriment to this film, and analysis of same, is the fact that as soon as someone says the word “Bigfoot”, many scholars laugh and walk away. 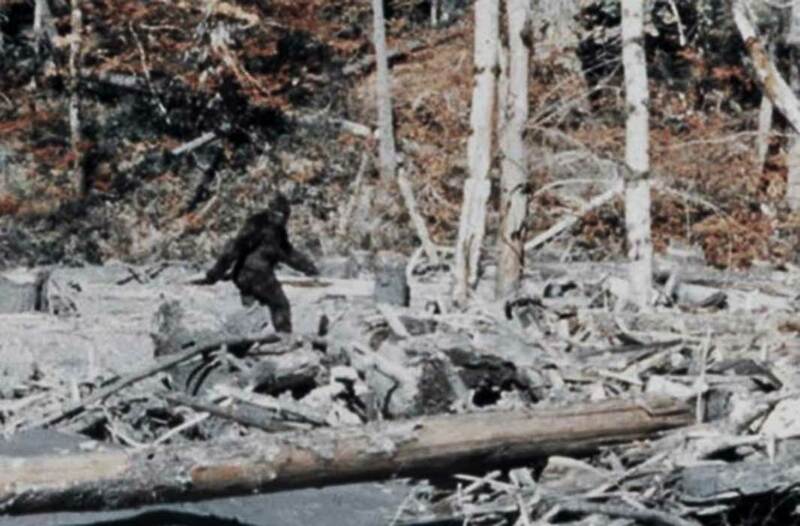 Because the concept of “bigfoot” tends to induce visceral reactions which may get in the way of a rational analysis, this author invites the reader to approach this topic with a truly novel frame of mind. 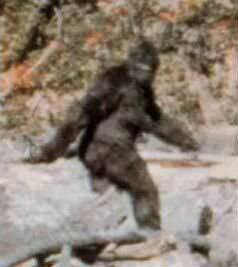 Forget there is anything called “Bigfoot”. Forget other sightings, forget the footprints and trackways, forget the wild paranormal claims. If you can clear your mind of the noise and distraction of the whole bigfoot phenomenon, just take this one film at face value. Describe it in your mind as simply film footage of a hominid-like figure walking away from a camera as the camera operator pursues the subject. Then ask yourself two simple and elegant questions. 1. Is this film a spontaneous and unplanned event, or a staged and planned production? 2. Is the subject figure seen in this film a human performing in a fur costume and mask, or is the subject a real hominid, biologically real exactly as it appears? Now consider the simple fact that for fifty years people have tried to prove this film was staged, and the subject is a human in a fur costume - and every effort has failed. Don’t you want to ask why all those efforts failed? And isn’t it about time to reasonably consider the alternative, that it may be real? If that were true, then it represents a new branch of the hominid family tree, a hominid with a skull like Paranthropus Boiseiand a skeletal composition similar to the robust Neanderthals, with a low crural index, an adaptation well suited for northern climes (as found on the Sami people of Lapland and the Inuit People of North America). And the subject figure has a robust fur over the body, a similar adaptation well suited for survival in the northern climes. Coincidence? Maybe, if the person fabricating the hoax costume was an expert in physical anthropology and hominid evolutionary anatomy. But how many anthropologists know how to design and fabricate a realistic ape/hominid costume? How many movie creature costume fabricators just happen to have a degree in physical paleoanthropology and evolutionary anatomy of hominids? Has science become so polarized and politicized that the classical agnostic position (“I will investigate this with an open and undecided mind, basing any conclusion on the evidence”) is considered naive and laughable because scholars are expected to immediately and superficially assume one conclusion with absolute confidence and once declared, be unwavering in their determination to maintain that conclusion against all real evidence to the contrary? Sadly, that exact situation may be occurring, when scholars refuse to even explore this topic and evaluate the work thus far done by researchers, and fairly weigh the pros and cons of the evidence and record analysis. Is confirmation bias sadly still ruling the roost, and a denialism of any prospect this film could actually depict a new member of the hominid family, regardless of the merits of the evidence? If this film proves to be a truthful event depicting a new and as of yet unidentified hominid co-existing with contemporary humans, the scholar who validates that truth will have accomplished an astonishing victory for science. One would think, given the magnitude of the potential reward, some scholars would feel that an investment in time and effort to evaluate the matter would be justified. And beginning some dialogues on that option, that the film may be authentic, would be a resounding demonstration that the scholarly community values truth above the mere perception of winning an argument, especially one derived from a mere wishful thinking to not shake the family tree. As long as this film defies any proof of a hoax, the option it might be real should be responsibly considered, rather than shunned, by the anthropology community of scholars. The most compelling reason why the matter of Bob Heironimous and Phillip Morris was not noted is that in the two critical texts cited “Daegling’s “Bigfoot Exposed” and Loxton and Prothero’s “Abominable Science”, both of these clearly skeptical texts did not recognize Bob Heironimous and Phillip Morris as presenting claims of sufficient merit to be factored into those author’s analysis. Even though all authors were aware of the claims, they did not use the claims to establish a proof of hoax. So if skeptical authors and researchers cannot be confident the Heironimous and Morris are making truthful and reliable claims, then I felt that any mention of them would have required a lengthy disclosure of the issues which cast doubt on their credibility. If one were to advocate those claims by Heironimous and Morris as being truthful and factual, the claims would need to be analyzed with the same discipline and logic as all other evidence should be, and under that kind of analysis, the claims have not proven to be strong enough to be taken as fact, even by many skeptical analysists. provide that kind of proof. My question would be why was that not addressed in your article? To those who have commented thus far, I thank you for your thoughts. But if this film is a hoax, I would like to see a proof, based on an examination of the eveidence, (actually described correctly) the method of analysis used, and the exact conclusion derived from that specific evidence. Also, I’d like to have the author of that proof give his/her name, credentials,etc. I don’t think that’s too much to ask, but I’ve been waiting 50 years to read that proof, and so far, it doesn’t exist. So I question why. At School, our then English teacher also did RE, it being a Catholic School and him being our form master in a Catholic Grammar school, way back in the mists of time.... well, we argued this because he felt evolution to be perfectly compatible with ideas of Darwin. Unlike my RE teacher, and Darwin, however I sensed intuitively that God our Creator was not in fact an ape from whom we were descended and whose Original Image we carried in our bones and our DNA, and was regaled always by tales of whomsoever dared to take the piss out of this brigandage of reason and logic we call faith, so, in my teens I came across the tale of how than venerable and irascible man of God Teilhard de Chardin, had assisted in the Piltdown man hoax, to crucify a few Darwinians! before later going on to discover, with others Peking Man in China. This hoax was perpetrated when I was in my teens and we all had a great laugh, watching the original film in repeats on our black and white TVs, because no REAL animal moves in such an artificial manner at all- you need to actually be able to watch the movie over and over to realise it, but that is certainly a human in a suit, or an angel of God posing as one, rather as "yetis" do in the Himalaya. 1) Not a scientific conclusion at all, but for me the film shows someone walking like a man in a suit. 2) The comments about gorilla suits may apply to a costume supply store, but just about anyone could create a better suit than the example shown. Movie makers had been creating much more realistic suits for a long time. Planet of the Apes, released the year after this film was shot, shows what was possible at the time. 3) Modern tools wouldn't be of much use in detecting fakery. It's not like we're talking about Photoshop, digital manipulation, special effects or any kind of post production trickery here. I think we can take it for granted that what we have here is an unmanipulated film. The only question is whether the film shows a man in a costume or something else.